This is our girl Sativa. She is a two and a half year old, beautiful sable. The love we have for this dog can't be put into words. Everyday she does something to surprise us and shows us how smart she is. She has very little alone time, as she goes with us everywhere. When people first see she is a German Shepherd, they get nervous. But after spending just a minute with her, their whole outlook on the breed changes. We have taken her to festivals where its jammed with people, kids and other dogs, and she walks on her lead like we are the only ones there. We have even been stopped by a lady who thought she was the most beautiful dog and wanted to take her picture. And of course she poised nicely! Never have we owned a dog that has gotten so much attention and so many compliments. She is a true treasure and one of us. 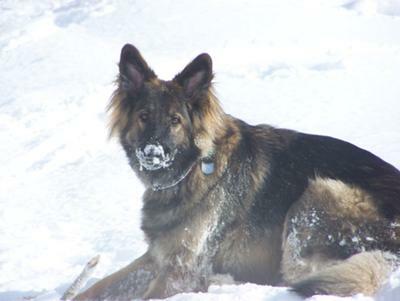 In this picture she is enjoying the snow and loves digging in it to see what she can find.